athleticism, quickness and power along with his incredible ability to read a cow is like no other. 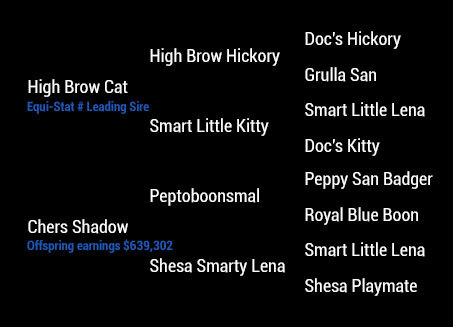 HIGH BROW CAT, Earner of $110,784. Equi-Stat #1 Leading Cutting Sire. Siring the earners of over $72,000,000. Bet Yer Valentine (Bet On Me 498). NCHA money earner. PATERA CAT (High Brow Cat). $87,440: Breeders Infvita- tional Non-Pro Classic Champion; NCHA Super Stakes Non-Pro Classic Co-Champion; 3rd, Breeders Invitational Non-Pro Derby; finalist, NCHA Non-Pro Super Stakes. CHERREY (Dual Rey). $27,646: NCHA Limited Open Classic/Challenge Co-Champion, finalist in the Open. DUAL CHER (Dual Pep). $27,038: finalist, NCHA National East $35,000 Non-Pro & $10,000 Amateur; ROM. SHEZA SMART RIDER (Flo Rider). $25,548: money-earner, 2014 NCHA Open Derby & Open Super Stakes. SHESA SMART BET (Bet On Me 498). $11,003: money- earner, NCHA Open Futurity. Chers Smoothee (Smooth As A Cat). $9,875: San Antonio Non-Pro Derby Co-Champion; PCCHA Summer SNovice/ Amateur Reserve Champion. 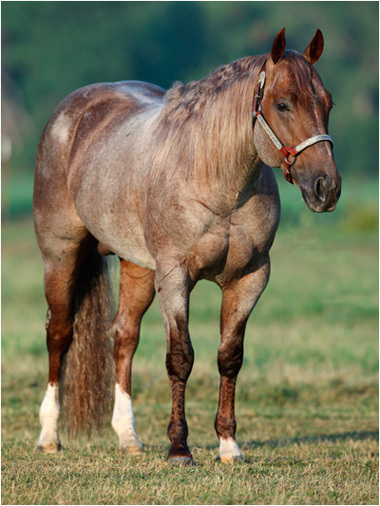 For a gray sire or dam, you must enter what color the horse was before it went gray as well as check the box labeled gray to the right of your color selection. Calculation accuracy of the offspring color possibilities and probabilities can be greatly increased when providing the color genetics of the sire and dam.